Luhrmann and DiCaprio team up again for an opulent take on one of America's great novels. 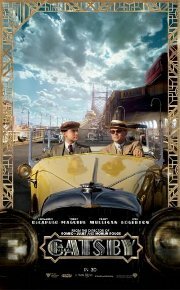 Set back in the 1920s amongst the super-rich, we follow a would-be writer as he leaves the Midwest and comes to New York City in the spring of 1922. Chasing his own American Dream, he lands next door to a mysterious, party-giving millionaire, Jay Gatsby, and across the bay from his cousin and her philandering, blue-blooded husband. Drawn into the captivating world of the super rich, the writer bears witness, within and without of the world he inhabits, and pens a tale of impossible love, incorruptible dreams and high-octane tragedy. This film is releasing in both 2D and 3D, this is the 3D version.